Who are the developers of indie games, and what are their motivations? GameLoading: Rise of the Indies attempts to explain what indie games are and who the people are behind them, and asks them why they chose this line of work. The film has all of the parts of a great movie, but it doesn’t feel like they really knew how to put that story together for it to be enjoyed by most people. In the end, it comes off as a film about independent game developers, for other independent game developers to watch and be appreciative of. If there is one thematic line through the film, it is the development of The Stanley Parable by Davey Wreden and William Pugh. 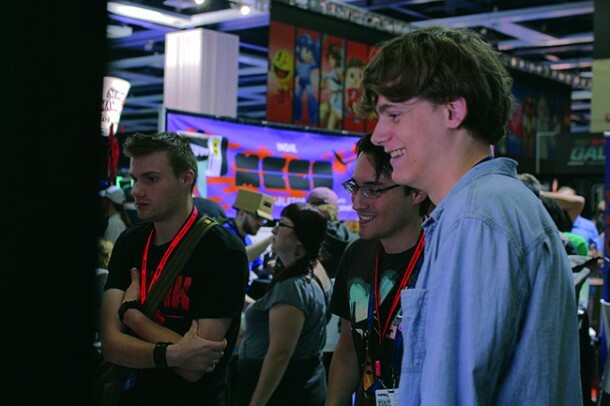 The filmmakers attempt to tell the story from early stages to Stanley winning the Audience Award at the 2014 Independent Games Festival, and intercut it with interviews and vignettes of a couple dozen other game developers all telling their own story. It can make for a frenetic viewing experience. Nothing is hard to follow on its own, but scenes jump randomly, sometimes with what seems to be very little connective tissue. While each story can be interesting, the lack of cohesion makes much of the movie feel like an anthology of stories instead of one tale with one idea. Like Indie Game: The Movie before it, GameLoading is trying to tell a specific story about games and the people that make them. Unlike IGTM, however, it doesn’t make itself accessible to very many viewers. However if you are an aspiring game developer, or simply really like the idea of game development, this movie is absolutely worth your time. This review is based on a STEAM copy of the movie sent to SideQuesting by the publisher. The Reviewer: Eric Smith is SideQuesting’s film guru, regularly dissecting upcoming and released films.